I have always been a visual learner. When I decided a few years ago to relearn how to knit I ended up getting a couple of CD-ROMs (remember those?) to use on my laptop. It gave me the basics, and I supplemented with other books and classes over the years. Teach Yourself Visually: Circular Knitting would have been in my hands if it existed, and I am still glad it is now. 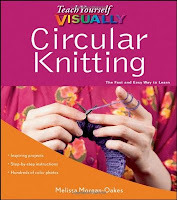 This book takes you from the basics of what you actually need for not just circular knitting, but handy accessories in general, on to the various cast-ons and methods used in circular knitting. Techniques for common problems, like how many times I have twisted when I joined the cast-on row, or caused jogs when colors are changed, are outlined along with how techniques are adjusted from flat to circular knitting. You can knit a flat pattern chart in the round! The projects range from a basic ear warmer to various pullovers in stripes and cables. For the hat, mitten and sock projects Melissa shows you how to take measurements to adapt each one for fit. Each pattern comes with helpful hints, such as "Choosing Your Yarn" when making the Double-Thick Potholder or "Choosing Your Stitch Pattern" when you move up to socks. Melissa emphasizes when you must knit a swatch for gauge (sigh) and how to not be afraid of steeks in a project (gasp). Applying scissors to knitted objects are as scary as cables, but maybe with guidance I will find myself with one of the lovely projects provided. Chapters on various stitch patterns to liven up your circular projects and technique overviews complete the book. I have been fortunate to actually take a class with Melissa before, and now I feel I have a way to go back to her instruction at any time with Teach Yourself Visually: Circular Knitting. 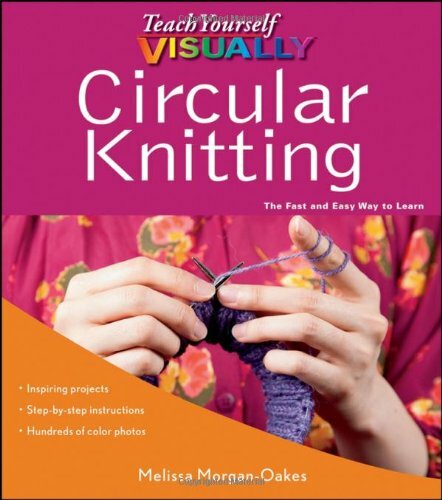 Whether this is the first time you are picking up circular knitting needles or you have been doing it for years, this book will be a handy reference for all.